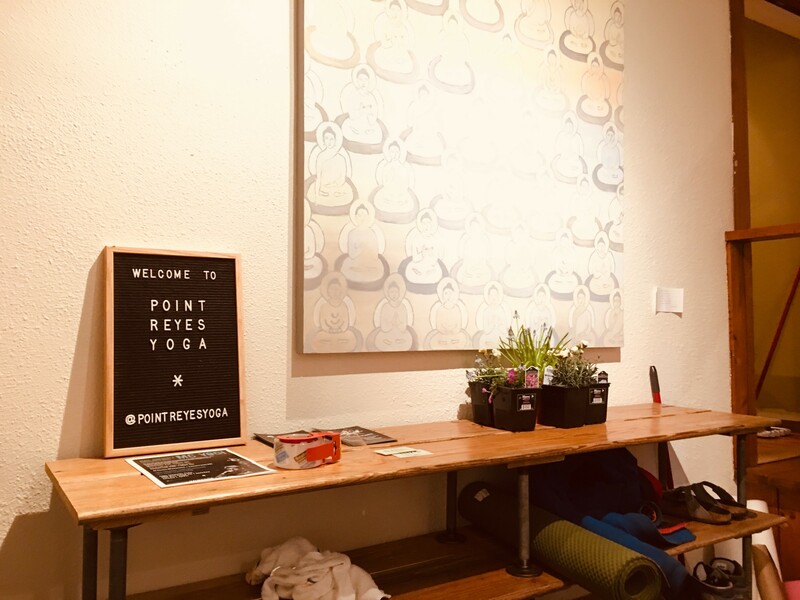 Sweet yogini friend took me to a welcoming yoga studio in a rustic barn, amidst the haystacks, bags of oranges and packets of seeds, past a little pastry & coffee hole in the wall, you will enter into this sight. There was this scenic drive to get us there which she took up with ease and all smiles despite the early Sunday morning start. Crossing the Golden Gate bridge, beautiful seaside landscape of Marin, opened up right before our eyes, beyond the horizon was endless ocean …merging into the vast blue sky … The stormy rain pounding the roofs the night before had cleared the air to gift us this most refreshing clean scent and ushered in bright sunny and azure skies. Debris, dust the well known SF fog, mist and whatever impurities that clouds our senses were washed away with the relentless downpour – the stormy and dark night is no longer – we were blessed with extra crisp and fresh air by this ocean town. What pleasure to just breathe this cleansed purified air. My lovely yogini friend wanted for both of us to attend a Meditative Yin class; then right after, Vinyasa Flow taught by none other than MC Yogi. I was happy to accompany and oblige. MC Yogi was first introduced to me by Tiffany who taught Kids & Family Yoga Teacher Training when I was initially interested in how kids yoga could fit into K-12 education in general. Tiffany being a former school teacher was an excellent teacher where she introduced her Yoga DVD. She mentioned to the trainees how happy she felt that MC Yogi had graciously given permission to feature his song called “Give Love” in her first video teaching attempt. In fact most and all kids and family yoga classes we taught pretty much started this theme song back then. Kids would squeal scream and ran around and we had great fun rolling on the mats laughing ! Here it is:) (I still have this DVD:) Then the tragic Earthquake/Tsunami of 2011 happened in Tohoku, Japan. At that time there was an outpouring of support, one of which was Yoga Aid and this song, “Give Love” was also featured as a theme song. So the timing is all mashed up now but with Tiffany, her husband, myself and my neighbor friend who later publishes a yoga book called “The Philosophy & Science of Yoga: The Power of Self-Expression 5,000 years in the Making” (good read), we all went to his new CD release concert at Asian Art Museum, SF. – what a flashback – that’s now 8 years ago – contributed towards was it Kickstart or some cloud funding and have seeen his music evolve where we mix them into our class playlist:) And so you might say that our family has been a low key fan all along and could not be happier to see this humble yogi and his lovely yogini artist partner, continue to make beautiful music, art and create this lovely place to practice yoga for the locals (lucky!) and visitors (stay-cation go-to) alike. One of my dear yoga teachers, who also was a musician once said, something to the effect that she believed there are broadly two kinds of people – broad brushstrokes for sure – those who think creatively and in the colors, designs and the arts); Then there are those whether linear or binary, tending to be rules driven, perhaps constantly analyzing whether it be profit/loss or black/white rather than appreciating the shades of grey – So it’s back to brain science of Right and Left Brain hemisphere dominance perhaps … Some yoga teachers tend to be more a technicians, and rather dogmatic in teaching and that suits them and their students well- there are clear rules and maybe something likened to flow charts and stick figures to prod the lesson plan ; however some, like him, seems like a natural – a fluid spontaneous teacher with a calling to cue skillfully with sense of fun and delight. Sometimes, words that roll out of his mouth is … pure poetry, so lyrical and yet based on solid yoga philosophy. And as expected, excellent playlist, it’s the yoga DJ, playing with words and spinning the tunes to bring us closer to … ourSelves. Honoring the authentic and all styles of teachers all around us. I learn so much from other gifted teachers we are blessed with in this Bay Area. Thank you to my friend who is such true yogi because if Yoga is about Connections, she was that – one who connects the dots seemingly unrelated sometimes but connecting over time; thank you for driving me there, driving almost 2 hours, to attend these two great classes, latter led by MC Yogi who made me realize that yoga need not be so serious but just … joyful. Back to the drawing board to have that “Beginner’s Mind” again. 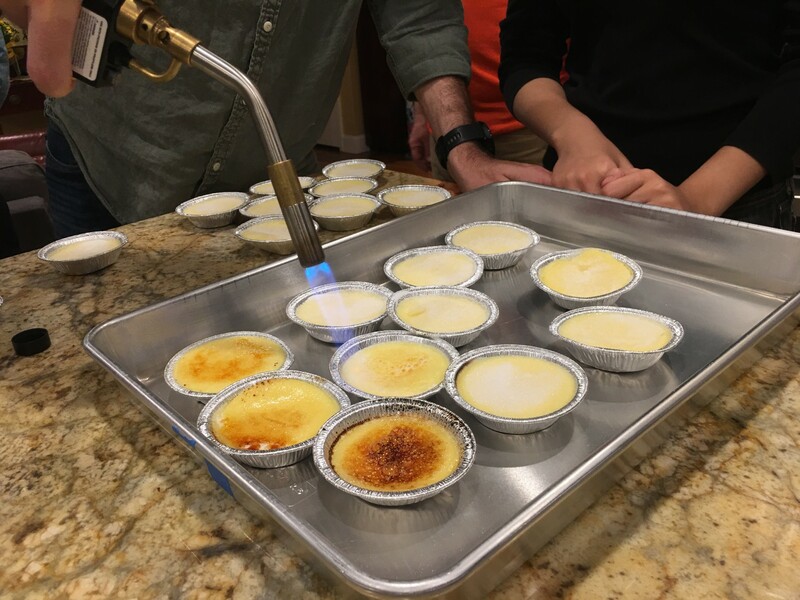 Taught my own two classes back in the Peninsula – San Carlos and Redwood City are neighboring and easy pleasy – the second one unexpected subbing, just to be of service – that evening – a rather subdued classes having been so inspired. Bring yoga into your lives – it’s so enriching …you will feel the subtle changes off the mat. Tuning into the subtleties and nuances that matter so much. what your intentions are. 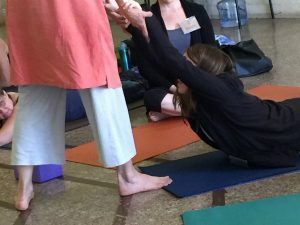 In the following posts, I will bring up some points to consider as you do your due-diligence of various yoga teacher training offerings locally and in distant-learning. First and foremost – most important question to ask oneself is, again and again: What is the intention. What motivates one to pursue this course of action. My intentions were clear when I embarked on my journey so I will have to ask what about yours? As for my own training beyond the 200 hrs. well spent with Sri Teacher Training (locally headed by Jean Mezzei and Brenna Geehan, advanced committed yogis whose lineage traces to Himalayan Institute, publisher of Yoga International), to go deeper meant more investments in opportunity costs and real out of pocket costs. Was that worth it ? (YES!) Unless you had a very mature practice and many years of that (or have a background such as gymnastics, dance or theater), many who obtain 200 hrs. of training are not well equo[[ed to face room full of students beyond the scripts and blueprints. 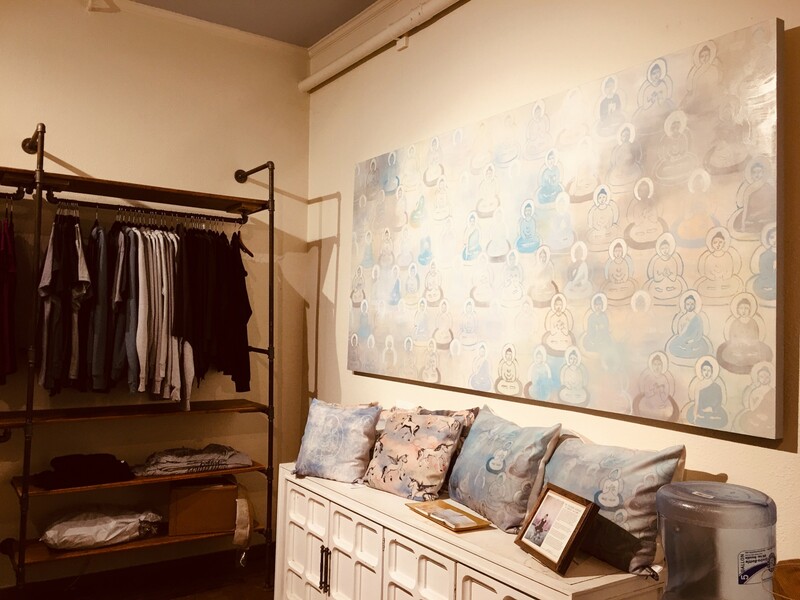 So, I was also fortunate to be invited to attend a pilot program, an internship at Nandi studio, a lovely studio, now an affiliate studio of NYC’s Jivamukti yoga school. Then … I taught for awhile at a community center, then a premier gym, and a local boutique yoga studio, then, took on some privates so that those who were intimidated in group classes can once again regain the confidence to get back to the group classes which I highly recommend – us humans want to be in a “tribe” however transient or long lasting – our lives are more enriched, more connected we are to each other, that is, after we learn to connect with Self. All these experience basically fueled my passion to learn more. Stoked, it seemed that desire for further learning sparked each time I led a class or attended a class. So, I evaluated various offerings near and far and decided to attend an Open House put on by Niroga. 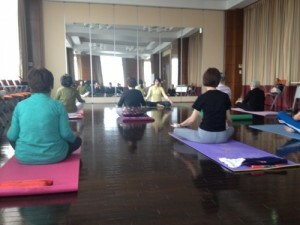 Impressed by the vibe of the place, I embarked on Yoga Therapy 800 hrs. training at Niroga Institute in Oakland, CA, a non-profit yoga education center. This is the simplified version of their curriculum I completed – HERE. While there were areas of overlap with the 200 hrs. TT, it’s interesting how a shift in perspective and clearer intentions make all the difference in how a student absorbs the material. 800 hrs. certificate from Niroga and certification with International Association of Yoga Therapists, gave me many things but most importantly the advance training gave me more … confidence. Yes, … CONFIDENCE and ability to observe and discern and design a protocol, based on solid updated knowledge (I use the word UPDATED as some classical? yoga is not in line with medical discoveries and advances in science made since) , practical techniques and … practice. Of course, it’s never enough and that’s the fun of yoga. So deep and so big, there’s always more to learn – Yoga is COSMIC and as much as it has answers, there are always more questions. I am in reviewing state (anatomy is fun!) but once the materials are regurgitated and digested, I am sure I will embark on even more learning to connect more dots and find a community of like minded. Yoga draws beautiful souls. Please look over the curriculum I linked to get an idea of the expanse of this program. Honestly, the learning that transpired there was very special – we had recent college grads, grad students, doctors both MDs and PhDs, therapists, former-Broadway actress, LGBT activists, former Ivy league grad Wall Street MBA, yoga studio owners and moms, retirees … I mean, students from all walks of life, each with unique stories, life & work experiences and intentions. 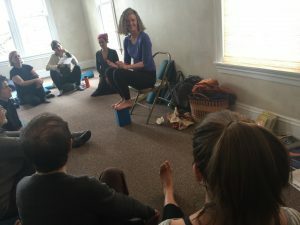 Imagine what happens in a yoga classroom when all these people come together under the guidance of BK, Rosalind and Heidi in addition to that months’ visiting faculty. It was an amazing mind altering and body conscious time of connections – Connections with each other, connections within ourselves, connecting the dots … from inside to outside… connections to the waves of vibrations … the energy, our communal PRANA, the common thread being our love and gratitude for this sacred practice of …yoga. The faculty was stellar and I really don’t know if there ever will be a training where they can assemble this kind of master faculty members, each an expert in their field. Here we were able to consider certain niches in the area of yoga education and therapy. During the 2-3 years I spent there, the Director and Founder, BK Bose, co-wrote and published a book on Dynamic Mindfulness targeting school teachers and students, where he saw the most optimal ways to make a difference in changing the lives of many at the most formative stage in our lives. 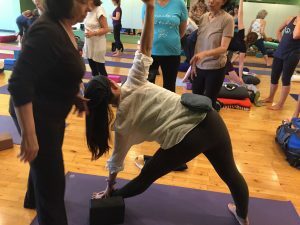 In order to focus on this renewed mission, Niroga has taken a break from offering Yoga Therapy training, consequently, 50 or so of us were the last of the 2-year program as Niroga’s mission has shifted. It’s sad but … schools are founded and their offerings will shift and evolve based on the leadership’s intention and vision. Hope as we start out this new year of 2019, we set our intentions with clear vision so that our dreams do not remain dreams but become a reality. We each have the power to realize our dreams if not today, tomorrow:) May your yoga practice on the mat, serve you off the mat. Serving Judith H Lasater’s TT as one of her assistants – a great learning experience. Gratitude for the opportunity to serve in small ways to receive the gift of inspirations she exudes with her thoughtful words and profound presence. She is witty, sharp and yet soft and always … knowledgeable. Read her book, “Living Your Yoga”, a little gem found in the ordinary everyday living. An easy read written by a committed and dedicated yoga teacher much respected. 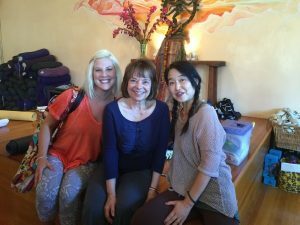 Pelvic Floor workshop in Berkeley with Leslie Howard – personally I think this is a topic to take up for women, as there’s so much need. Kegal exercise is not enough …Walked away thinking … for the goddesses, how about “core” and … add on the “floor” !? Yes, it’s “Core & Floor” 🙂 I just thought it up – can we coin this as a title for a workshop? The floor is the “container” of our vessel, the body with all the internal organs served up. At Niroga …another inspiring master teacher, Saraswathi Devi. Trained in India, she’s that powerful and graceful yogini who has been teaching for over 40 years – she has that incredible VOICE fit to be an opera singer. Nothing but respect for this karma yogini, helping so many bound in various limitations to break free of physical shackles to regain freedom and ease – she’s truly the light lit in the shadows and darkness of some in despair – she is a personification of what hope and strength looks like.. 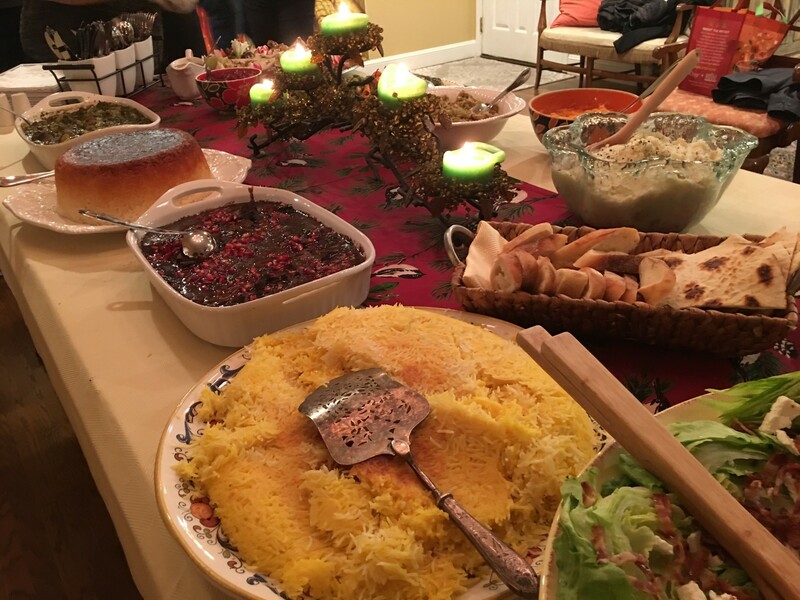 Which was only possible because we were not hosting this lovely Thanksgiving gathering. 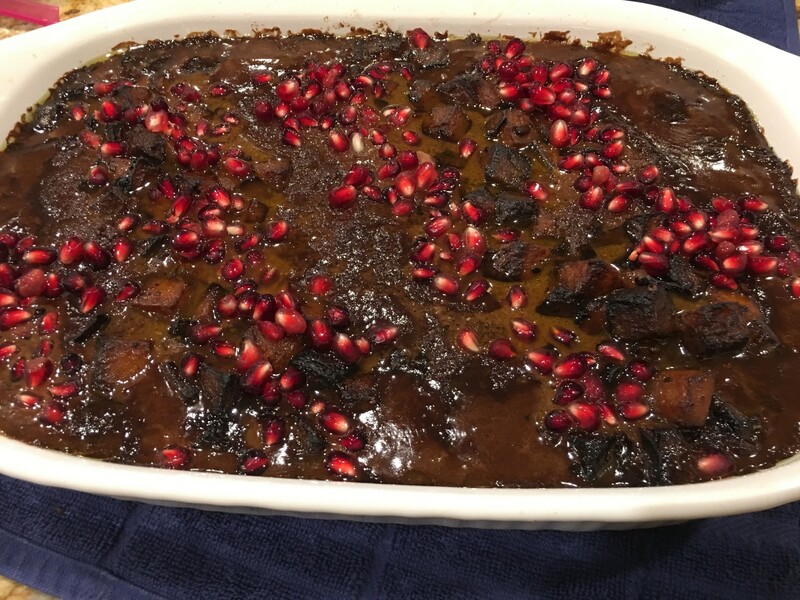 Thus, GRATITUDE to a special generous friend, she’s a bright Light – a chef-extraordinaire and her family – without which I would not have been able to serve in my other ways. Teaching 2 classes back to back was … FUN ! I love being of service and wish these could have been a benefit for the recent fire victims. Nice touch – vegetarian stew:) Delightful. Discovering rich flavoring is possible 100% plant based. Oh, ohhh, Mojitos? 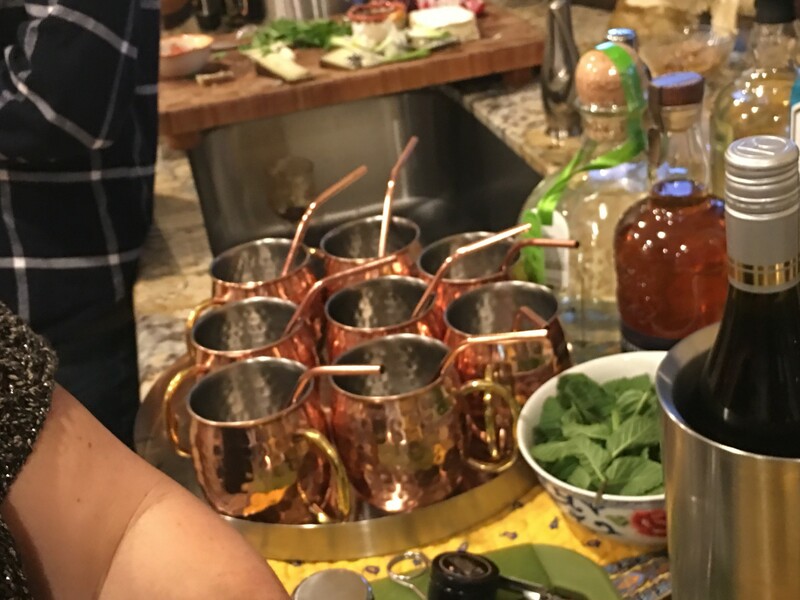 no, no, Moscow Mule ! Did not have any but love to shake that cocktail shaker for fun. It must have been meant to be that I was teaching the day after to help out a yogi – something told me abstain and so I did not have a hang over !!! Then, it will truly be a Black (ed out) Friday …splattered on a yoga mat – did not happen ! Thankful. * Get well soon C ! Holiday season is actually one of the most stressful time of the year. Sure, it’s joyous but for some, if you make it into a production rather than what it’s really meant to be, then … there’s high pressure to meet that deadline, the same deadline everyone has, that intense pressure to please all, to have that perfect Norman Rockwell holiday season and so … step back, take a deep breath and prioritize.